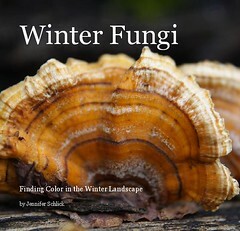 OK, this is the last time you have to hear about this… I finally put the finishing touches on the Winter Fungi book that I self-published. You can order your millions of copies by clicking on the photo of the cover at left. I promise I’ll never mention this again. Jennifer- Congrats on the book, I put together a book of just photos last Christmas and that took a ton of work, and it didn’t even have words. The cover looks great, and I looked through the preview and wow, it really looks awesome as well. Don’t make promises like that! To be honest . . . I think you should put something on your side bar promoting it! Well that’s if you want a million copies sold! Hey, if I get one will you sign it?